Avengers: Infinity War is the culmination of the past 10 years of superhero movies within the Marvel Cinematic Universe. Fans of the franchise will laugh and cry as their favorite heroes go up against the toughest foe they’ve ever encountered, while non-fans will wonder what all the fuss is about. Essentially, this is a movie for the devotees of this billion-dollar series. If you are not on the Marvel train yet, either engage in a massive binge session to get caught up, or wait until The Incredibles 2 next month for your superhero fix. The story sees several members of the Avengers team (who are too numerous to mention) battle the malevolent alien Thanos (an intimidating Josh Brolin). Everyone will put their egos aside in order to stop Thanos from getting the magical Infinity Stones and annihilating half of Earth’s population. Avengers: Infinity War will thrill and emotionally devastate series fans, but the uninitiated will be lost. Despite the downbeat tone, the film contains unexpected humor from the character interactions and some of the best action in the franchise. The performances are uniformly strong, and Brolin steals the show as one of the series’ best villains. Lastly, the emotionally charged ending is nothing short of heartbreaking for fans, changing the rules for both this universe and superhero films as we know them. 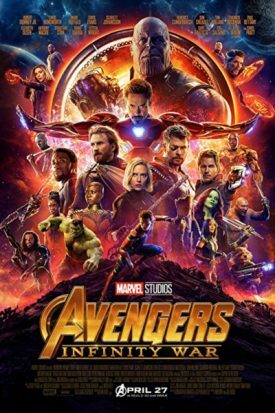 Avengers: Infinity War is a thrilling, fun, and emotional climax to the past 10 years of Marvel’s reign over the multiplex. May future installments continue to entertain as much as this.